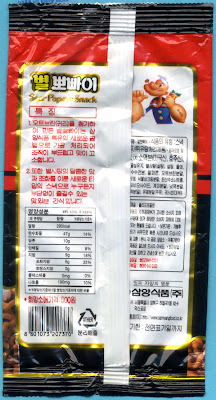 He's not sponsoring spinach, but Star Popeye Snack (Byeol Popeye) produced by Samyang Food. I found this at a stationery/toy shop. I think this is a very rich package design. 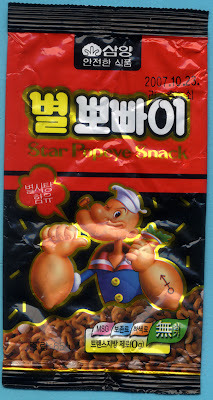 On the front, Popeye is saying, "star candy included". And he wasn't lying. There is white sugary star candy mixed in with the mildly flavored noodle cookies. I've also seen Popeye being used to sponsor a singing room (norae-bang). Tom and Jerry are classic U.S. cartoon characters that are used much more frequently in character goods in Korea. Be sure to come back tomorrow for the start of exciting Halloween posts! I think it only makes your teeth strong because it's so hard.